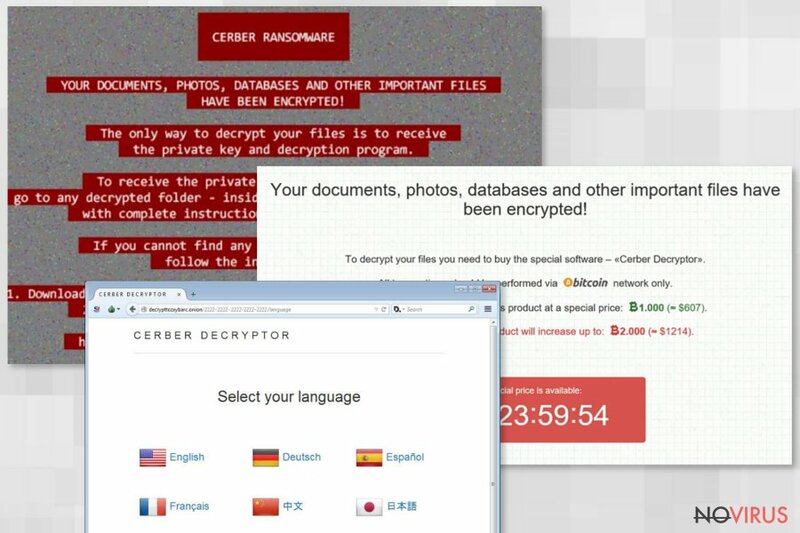 Cerber Decryptor ransomware uses sophisticated techniques to infiltrate computers and hide from its victims. Use Reimage to determine whether your system is infected and prevent the loss of your files. 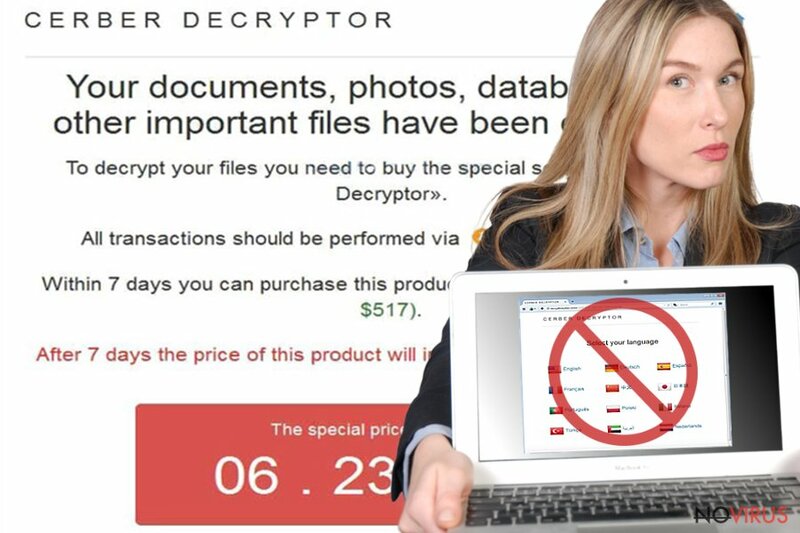 Cerber Decryptor: can you trust this application? If Cerber virus has befallen your computer, you might either go into a panic and start collecting the ransom or search for a decryption tool. When the virus opens its respective file with the instructions, you are led to the website of Cerber Decryptor. It is software, created by hackers, which is said to decode the files locked by the ransomware. We would like you to warn you not to fall into the deception devised by the cyber criminals. This tool may only make matters worse since it is likely to plant its files among the important system registry keys. Thus, when the time comes, they may be activated, and Cerber virus entangles your computer again. Instead, we recommend you to concentrate on Cerber Decryptor removal. No one would have guessed that Cerber would grow into such destructive malware as it is now. Initially, it was launched as an ordinary ransomware which targeted valuable information. 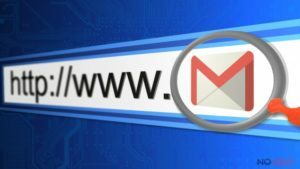 While IT experts had almost come up with free decryption tools, the cyber criminals struck again with the updated virus. It is reported that the current version of Cerber malware is able to assault users even via voicemail messages. In other words, the infection might be hidden within an audio file. Furthermore, the recent versions of the ransomware are able to connect the infected computer to a botnet or, in other words, a network of machines which automatically transmit the ransomware infections. Thus, against your will, you may become a distributor of Cerber ransomware. The contact with the software occurs at the time when you open the file containing the recovery instructions. The file indicates that you need to install Tor browser and then access respective domain – http://decrypttozxybarc.onion/2222-2222-2222-2222-2222. This should lead you to Cerber Decryptor. However, the main risk of installing this tool lies in the probability of getting infected with the virus even more. While the ransomware itself is a challenge for IT specialists hackers, the software may only worsen the situation. Anything that comes from hackers should cause suspicion and distrust. That is why you should remove Cerber Decryptor at once. In addition, the software is not granted for free. You are expected to pay 1300 USD (£884) for the ability to decode the information. Even if it manages to decrypt the locked personal data, it might hide its malignant files on your computer. Thus, they might lurk there until the cyber criminals decide to launch the attack again. Therefore, your top priorities should be Cerber Decryptor removal and elimination of the ransomware. You can perform both removals with the assistance of Reimage. You can entrust the elimination of the decrypting software and the virus to the anti-spyware program. Run it along with the primary anti-virus program. The malware removal tool is apt in detecting similar threats like ransomware and removing it. If you can find the software on the system, you can perform Cerber Decryptor removal manually. Nonetheless, regarding the fact, that is related with highly aggressive ransomware, you should still proof-check your system with the security program. It is likely that the virus has disabled the anti-virus application. In that case, feel free to use the recovery instructions provided below. Lastly, after the computer is fully cleaned, think of the data storage alternatives. Do not forget to back up your files regularly as well. Sign in to your account and launch any Internet browser. Download a legitimate anti-malware software, for instance, Reimage. Make sure you update it to the latest version and then run a full system scan with it to detect and eliminate all malicious components of the ransomware to remove Cerber Decryptor completely. In a new window that shows up, click the Next button and choose a restore point that was created before the infiltration of Cerber Decryptor and then click on the Next button again. After restoring the computer system to an antecedent date, install and check your computer with Reimage to uncover any remains of Cerber Decryptor. It is strongly recommended to take precautions and secure your computer from malware attacks. To protect your PC from Cerber Decryptor and other dangerous viruses, you should install and keep a powerful malware removal tool, for instance, Reimage, Malwarebytes MalwarebytesCombo Cleaner or Plumbytes Anti-MalwareMalwarebytes Malwarebytes. This post was published on 2017-08-30 at 10:59. Category: Ransomware, Viruses. A list of Viruses associated with Cerber Decryptor. You can quickly scan the QR code with your mobile device and have Cerber Decryptor manual removal instructions right in your pocket. What method did you use to remove Cerber Decryptor?